Just the planting yet to come in the finished project, from above. Sorry, I’ve been AWOL. 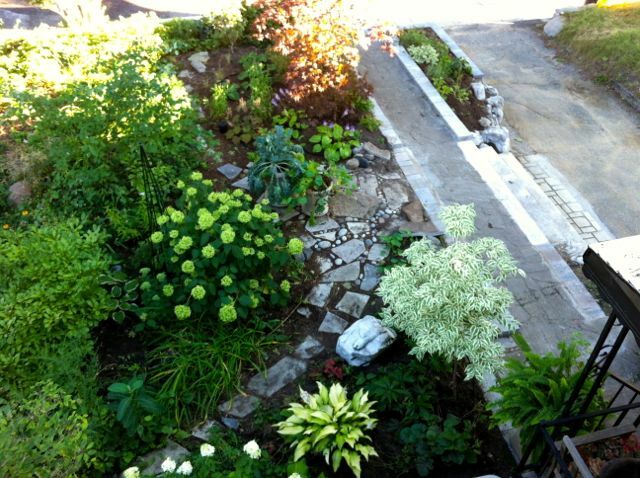 One thing that waylaid me has been a major phase of our front yard transformation I’ve called our Grand Simplification. Rather than building to a climax in the retelling, I prefer to start at the end, showing you the almost finished results now. Then, if you want to stick around, I’ll take a few posts to share a little of what we learned in this major DIY project. Scroll back and forth to see the before and afters. 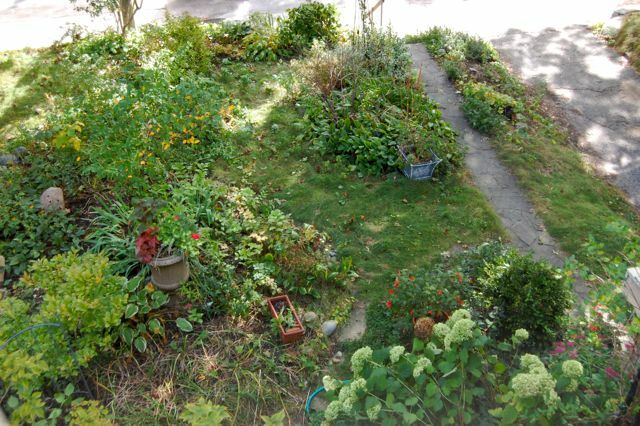 Here’s the same garden back in 2009. I wrote about one of our interim steps, including ridding ourselves of most of the lawn, earlier this year. 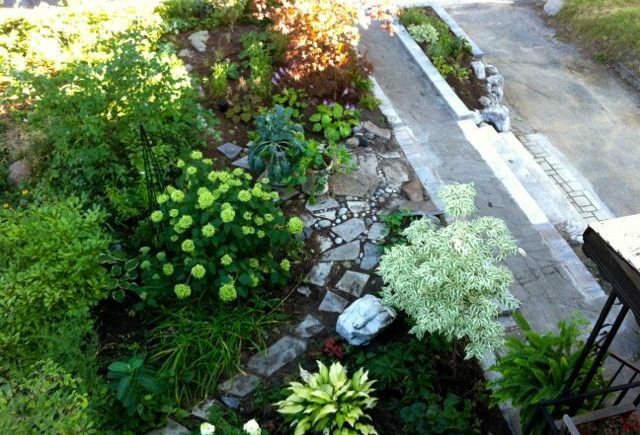 This summer, we tackled the difficult slope along the driveway, and the narrow front walk. You can see it “before” in a late-winter shot – albeit, distorted into a curve by the panoramic photo stitching. It was always too steep to maintain, in any sort of horticultural sense. And, our city driveway is so narrow, that you took your life into your hands trying to get in or out of a vehicle. Now, it’s easy to open a car door (on our side of the shared driveway, at least), and our new steps create an inviting alternative to the congested feeling of the rag-tag grassed slope. Next time, I’ll share some of our planning process so show how we approached this solution. Thanks very much, Gail. The view from our bedroom window is the perfect place to get the big picture. What a stunning makeover!! I am very impressed with the side view of the steps (and its before slope!) Love the variegated plants in the first photo, the tree (?) especially stands out nicely. Well done!! Janet, the variegated tree is a small dogwood Cornus kousa 'Summer Fun' — it's said to be quite compact, growing no more than 12' tall. We'll see what nature decides. Thanks! Too much root competition for veggies in the garden proper. But it you take a closer look at the containers, you'll see chard and kale. They need watering, mind you, but they are there. And I'll be doing it again next year, too. Looks great! What a treat it must be to use those stairs. Fereshteh Hashemi on Want to win the Gardener’s Gratitude Journal? Betty on Want to win the Gardener’s Gratitude Journal? 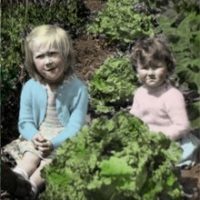 Christine on Want to win the Gardener’s Gratitude Journal? Margaret on Want to win the Gardener’s Gratitude Journal?